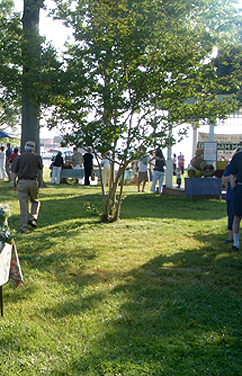 Established in 1998, St. Michael's Farmers' Market is one of the prettiest market settings in the US. It is located in the historic town of the same name on Maryland’s Eastern Shore. Sited right on the harbor front, the market is a popular weekend destination for locals, visitors and boaters. A variety of events are held during the season, including visits by guest chefs and hotly contested community cook-offs. Farmers offer fresh fruits and vegetables, meats, cut flowers, potted plants, breads and pastries, cow's milk cheeses, orchids, eggs and honey and a whole lot more. Location: In Muskrat Park in St. Michaels, Maryland.